Just as Jesus cherished children in his ministry, First Baptist believes in caring for the growth of the whole family. We believe it is important to teach and walk with our children as they begin to lay the foundations for their relationship with God. At First Baptist, we emphasize the importance of loving and serving others. We want every child to grow up and have the wisdom to make wise choices, faith to trust God no matter what life brings, and to build friendships and treat others the way they want to be treated. To do this we build our lessons so that children learn about God, trust God, and show God’s love to those around them. Our Number One Goal is for all children to have this verse as their priority : ‘. . . with all your heart and with all your soul and with all your mind.’ This is the first and greatest commandment. And the second is: ‘Love your neighbor as yourself.’ Matthew 22:37-39. We highlight four faith skills to help kids grow in their relationship with God, and to reflect how kids and families talk about faith. When we read the Bible, and listen to what God has to tell us through His Word, we learn we can trust God no matter what. Through prayer we connect with God. We show gratitude, say we’re sorry, and express our feelings to God. When we talk about our faith, we learn more about God and can tell others about Jesus. Worshipping God is more than just singing songs. Worship is about living life in a way that honors God. Want to get your family more involved in the children’s ministry? Contact our children’s minister Paula Thompson by calling the church office 706-322-4468 or 706-326- 2638 or by EMAIL. On the 3rd Tuesday during school months, we host a Bible Study at the home of our Pastor and his wife. Jimmy and Roxann enjoy hosting the youngest members at their home and this event is a favorite of all FBC children! This unique opportunity allows our children to have a one on one, personal relationship with the pastor. Held from 5:30-7:30 pm, dinner and crafts are provided. Kids Celebration held during the dinner hour is a time the entire church can hear what our children are happy about so that the whole congregation can celebrate with them. Children then depart for the library for story time. Children's Choir is next at 6:00 with two age groups, (3 year old through Kindergarten) and (1st through 5th grade). The 1st through 5th grade choir performs a musical each Spring. Mission activities are the last stop for the night. The younger group has Mission Friends and the older children attend GA’s (Girls in Action) for girls and RA’s (Royal Ambassadors) for boys. After Mr. Jimmy has children's time during the 11:00 AM service, the children leave the sanctuary for Children’s Church. During this time a Bible story is told and activities and discussions lead them to apply the story in their lives. Held monthly during school, this is a fun time with Mr. Jimmy and Mrs. Roxann. Crafts, activities and a meal are shared after Bible Study time. SAVE THE DATES! The annual Easter Egg Hunt is held at the beautiful home of our church members, Lamar and Sandra Beck. Thousands of eggs are hidden on their lawn and then gathered by children from birth through 5th grade. Not just for children, this great event is for the young at heart too! Come and enjoy great hotdogs and hamburgers, hayride, pony rides, games and more! Vacation Bible School (VBS) is held yearly the first full week of June. It's a week of fun, fellowship, and learning Bible stories. Our day begins at 9:00 in the gym with opening assembly and is then followed by crafts, snacks, recreation time, music and bible study. We conclude with a closing assemble at 12 noon. Passport Kids Camp is a mission driven time away for grades 3-5. We have attended camps in Crossville, Tennessee and Spartanburg, South Carolina. Children are supervised at all times by chaperones. 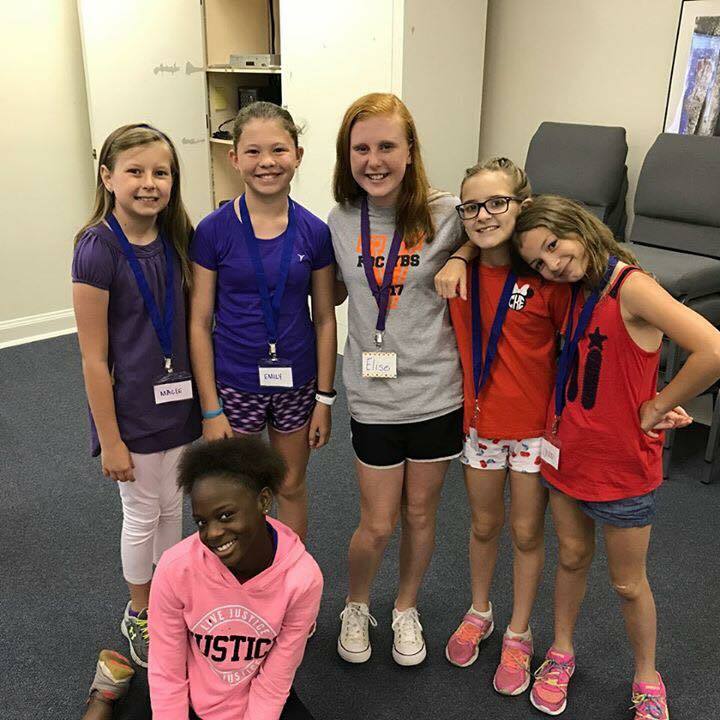 Terrific Tuesdays in the summer allow children to hear the word of God, play games, make friends, bowl, rock climb, swim, and take field trips to Callaway Gardens. 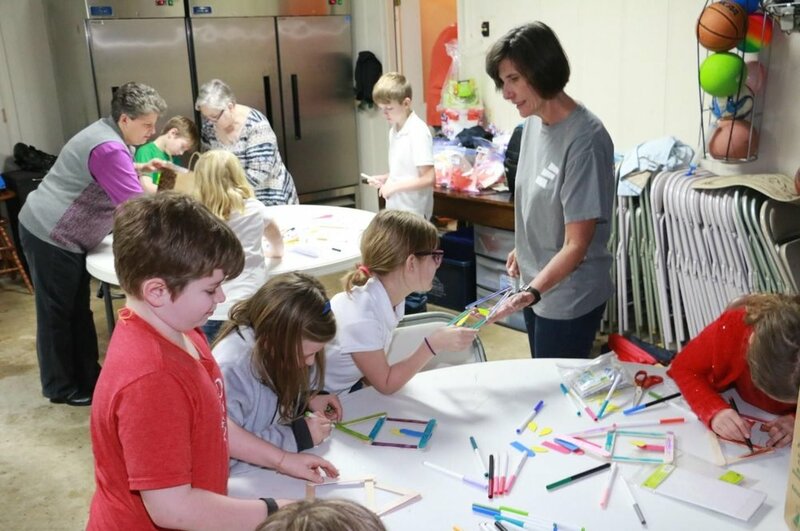 They also participate in mission projects such as making cards for Meals on Wheels, delivering goody bags to the Police Department, decorating bags for the Shoes that Grow project, and visiting the food closet. Come out for some fun as we say goodbye to summer and say hello to a new year of Wednesday activities for kids! Held in October, Fall Festival is a family time featuring games and inflatables, a costume parade, cake walk and more! The gym is transformed into a huge fun house for the children. Cotton Candy, popcorn and a goodie bag are free of charge. Hotdogs and chili, chips and homemade desserts may be purchased with all proceeds going to FBC missions.